Shopper's Voice Reviews - Legit or Scam? Shopper’s Voice Reviews – Legit or Scam? 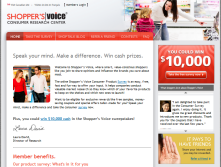 Shopper’s Voice, located at Shoppers-Voice.com, is a new consumer research center, that allows you to “Speak your mind, Make a difference, and Win cash prizes” through their consumer product survey. Their Online Shopper’s Voice Consumer Product Survey takes ten minutes to complete and is described as an “easy, free, fast, fun way” to give your insight and opinions to companies on your favorite products, and on what new products you would like to see. Completing the survey makes you eligible for free samples, money saving coupons, special offers, and cash sweepstakes. It also results in free membership in the Shopper’s Voice consumer panel. After you take the survey, you automatically become a member of the Shopper’s Voice consumer panel. If you complete the survey by mail, you will become a postal member, and if you complete the survey online, you become an online member. After completing the survey, you will begin receiving “valuable offers” from companies based on your survey responses. You may also receive invitations to earn rewards from other companies for completing their surveys or offers. Postal members that provide their email address will receive offers both through the mail and electronically, and online members that provide their home addresses can do the same. Shopper’s Voice is not a market research company. Rather, they are a company that collects your personal information and then shares it with their partner companies, so that they can contact you with coupons, advertisements, and marketing offers. Real market research companies get your personal information in order to provide you with surveys which earn you cash or rewards once you complete them. Instead, Shopper’s Voice collects your personal information in order to give it to companies who want to advertise to you. If you are still interested in the special offers and possible coupons, just keep in the mind the volume of mail and email you are likely to receive from advertisers when you provide them with your contact info, and perhaps use a specific email for this purpose. Average Rating for " Shopper's Voice Complaints " is 1.15 out of 5 based on 20 reviews. i just tried this and it was all bad..... what do i do? This place is a SCAMMM. They send you fake cheques. This business is a scam. There is no way to complete the surveys and I have tried many many times and have yet to complete one. They just give the same questions over and over again. I think it's a scam. They ask too many personal questions that are none of their damn business. I unsubscribed but I keep getting their crap anyway. PLEASE PLEASE NOTE THIS IS A SCAM. If they send you a cheque, please don't deposit it. If you deposit that cheque that bank will think you have that money in your account, the cheque will bounce and the bank will withdraw that amount and sent back to them. They will then scam you of your own money. Your will be out the money and NSF charge of 45$. this site is a scam please don't do anything with them. We agree. Don't deposit that cheque. As noted below, Shopper’s Voice never sends a cheque out of the blue. We go through a notification and confirmation process before any cheque is sent and we work with the winner’s bank to ensure that the cheque clears. RECEIVED UNSOLICITED TEXT MESSAGES AT 2 AM LAST WEEK AND AGAIN WHILE I WAS AT AN IMPORTANT MEETING TONIGHT. They sent me a cheque saying my forst assignment was to deposit and cash the cheque and i get 450 for my service. Now that cheque was released on saturday and i did what i was supposed to but now my account in -3850$ and i am totally screwed and not sure what to do i have kept all the emails. Any advice? We agree: it's a scam. Shopper’s Voice never sends a cheque out of the blue. We go through a notification and confirmation process before any cheque is sent and we work with the winner’s bank to ensure that the cheque clears. Yes they sent me a Cheque also. to me it looked very strange and odd. that i was going to deposit that much into my account. The cheque didn't look that real to me also. So yes a scam it is, you deposit the cheque the cheque will bounce, the bank will think you have that amount in your account and will withdraw it and sent it back to them, leaving you -$3850 and NSF charge for $45. I would go into your bank and speak with a manager not a teller a manager and explain to them. They will look into an figure out that it is a scam. You will get your money back but it can take up to 30 days. Banks frown upon this, they will investigate.